Dr. Miller’s practice provides comprehensive care for disorders of the eyes. 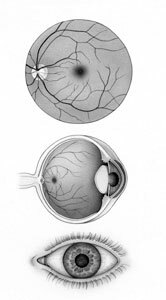 Dr. Miller is assisted by a dedicated staff who have many years of training and experience in the field of Ophthalmology and in general patient care. Our front and back office staff are helpful, friendly, and eager to assist our patients in any way they can. In our approach to patient care, we are committed to enhancing the quality of life of every patient we serve through the treatment of eye disease and the restoration and preservation of vision. We interact and care for each patient as we would a member of our own family. We strive to give every patient the latest advances in modern eye medicine in a caring environment. We look forward to answering any questions or concerns you may have, and we welcome the opportunity to serve your vision and eye care needs.